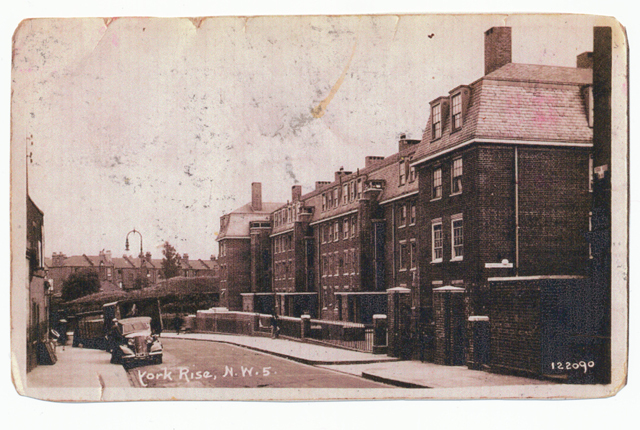 The first tenants at York Rise, in 1938, were families who had previously been housed at the rear of Euston station. The land was needed to extend the station and the railway company was obliged, by law, to rehouse their workers. The company owned land in Dartmouth Park which they leased to the Housing Association and paid for the flats to be designed and built. Families who moved here couldn't believe their luck, moving from overcrowded unsanitary tenements to new, clean flats near to Hampstead Heath, with gardens and space for their children to safely play outdoors. 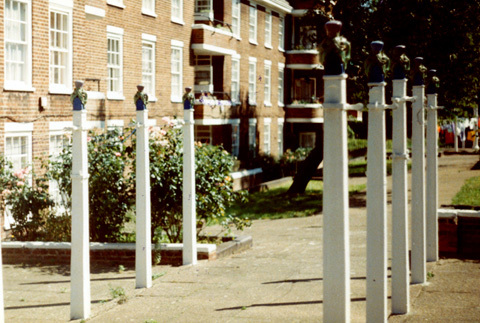 The flats had other amenities: a built in kitchen with larder, a range (fire/stove) in the living room, a balcony to sit out in the sunshine, a wooden airer over the bath, a copper in the kitchen for heating water - even the drying lines outside, innovative in itself, were topped with ceramic finials created by Gilbert Bayes, Royal Doulton's ceramic genius, some of whose work is now in the Victoria and Albert Museum. 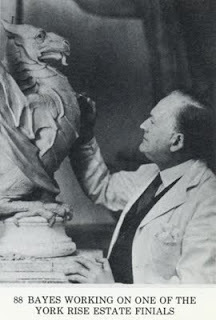 The granddaughter of one of the original families has contacted me through this blog and wrote, "I'm sure uncle Fred was proud of his little patch and wanted other people to like it too, I think that was the prevailing attitude of the place. I know they all thought they'd won the lottery when they moved there, a long way to move in London terms but at least all your neighbours came too and you got your own front door and indoor loos and proper bathrooms for the first time. I can imagine them all arriving en masse raised some eyebrows among the locals too." Just think, a journey that now takes 10 minutes by car was considered in 1938 to be moving a long way off your patch - in fact, people used to come up here from 'London' for their holidays a hundred years ago! The flats were gated at both entrances creating a little community enclave. An on-site caretaker kept an eye on everything (and everyone) and every flat had a balcony window box for growing flowers. In between the blocks, gardens were built and the railwaymen's families quickly developed a love of gardening in their spare time. 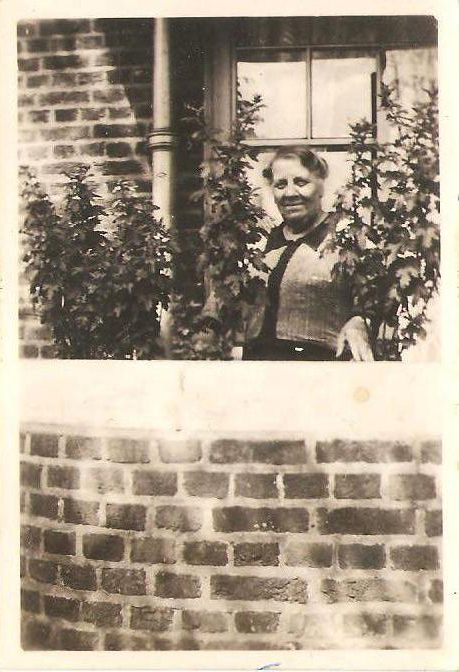 I've been told that during and after the war, when rationing was in force, gardening skills were put to good use growing vegetables. The first ever female chartered surveyor, Irene Barclay, was involved with the housing association and York Rise flats from the start; it was her influence that safeguarded these outside spaces during the build. One of our neighbours who has lived here all his life, remembers winning the annual gardening competition aged 8 in 1954 - although he confesses it was with the slight help of an older boy! 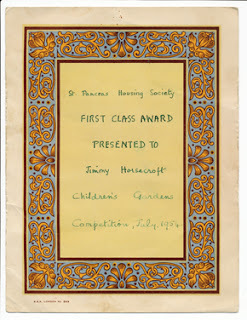 Between 1960 and 1980 there was a children's gardening club run by a lovely Irish lady, Dolly Slee, a tenant whose children had grown up and left home. What happened to the gardens after that, I don't know. 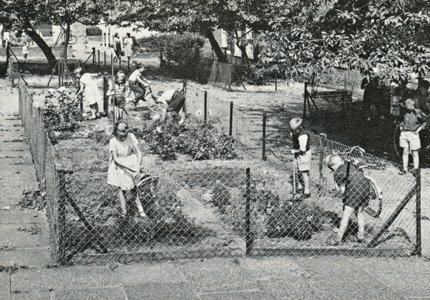 By 1990, however, the fence had been removed from the children's garden and a low wall built around it, the annual gardening competition had been abandoned and the garden was filled with small shrub roses. 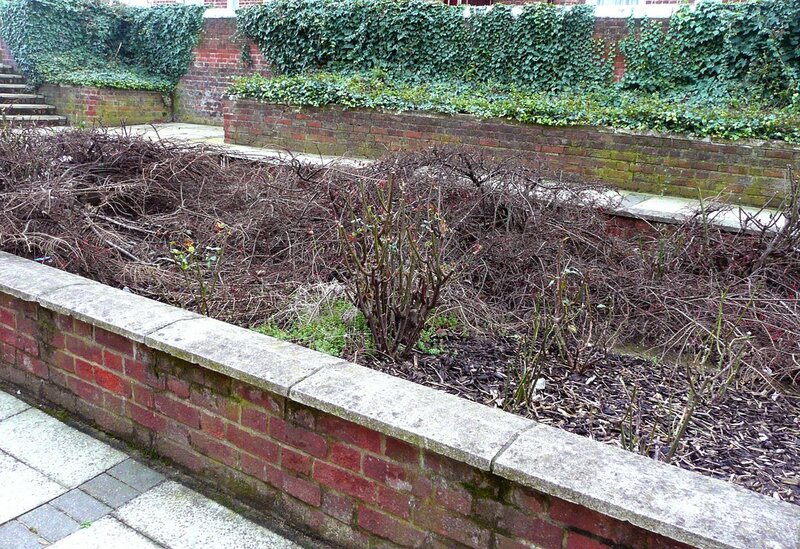 A decade later, cotoneaster sprawled across the garden, ivy choked the walled borders, and shrubs went unpruned. Honeysuckle grew unchecked over everything. 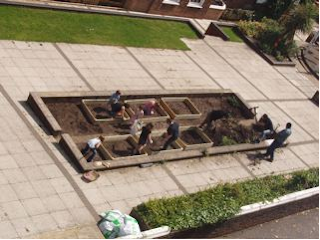 The old paving was removed as part of the maintenance programme in 2003 and, in laying new slabs, large chunks of the grassed areas were lost. Trees growing at an angle were deemed unsafe, removed and not replaced. Gradually, the lost gardens of York Rise settled into a state of neglect. 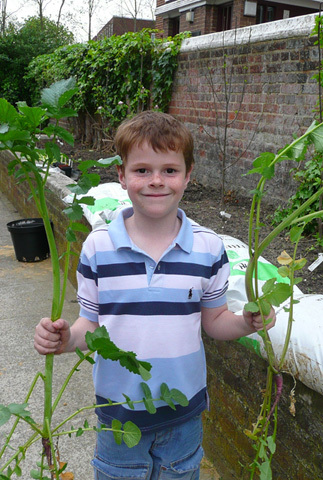 In 2009, a small group of us were asked whether we'd like to apply for Capital Growth funding in order to grow vegetables. Yes, we'd be up for that. We were given permission to use the borders and central bed of the neglected gardens, with all the work that entailed, and were awarded half the grant we'd applied for - just enough to get started. As with all community ventures, the numbers involved fluctuate. 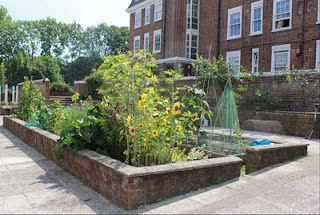 About 8 of us attended the initial meeting; then we had help from the Time Bank for clearing the central bed, and our numbers doubled when the first garden had to be dug over and the raised beds built. 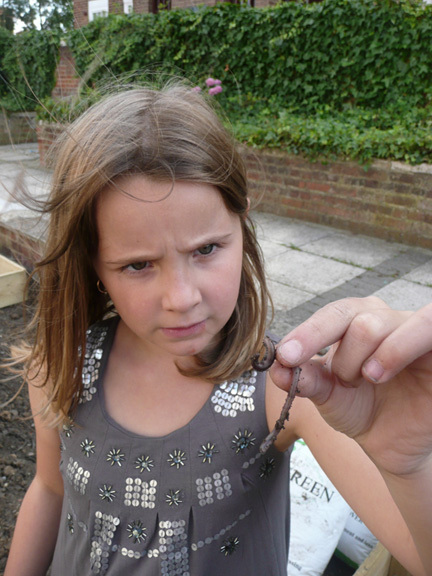 As the compost filled the beds, it was hot, it was the summer holidays; numbers dwindled. A few first seeds were sewn, even though it was August. Help needed for watering in the evenings caused numbers to dwindle further. By the time we had to clear ivy and shrubs out of the long walled border, we were down to 2: me and Leigh. On an exceptionally cold day in November 2009, a neighbour turned out to help us plant the fruit trees. The following Spring, as the garden came to life again, more people stopped to ask what we were growing and why. Children came out to question and taste. They wanted to help, especially if it involved watering! 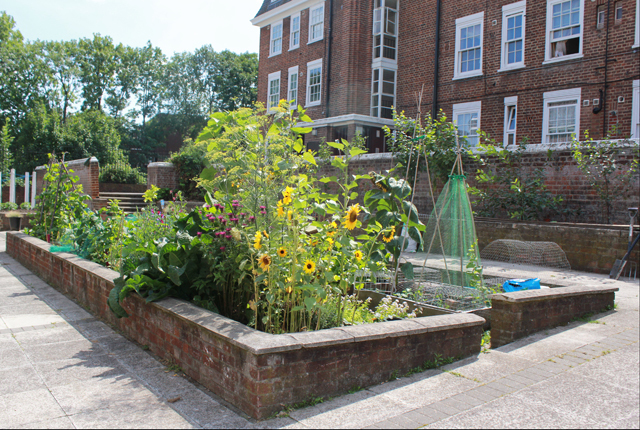 In the summer of our second year (2010), people stopped to say how wonderful it looked now that the gardens were being used again. There was lots of support, usually emotional rather than physical but, sometimes, that's a start. The project has not been without its difficulties and set backs; we're right next to a railway line which means visits from fox cubs who want to play, usually with the worms in my newly planted beds! A thief arrived in the night to steal off with our chicken wire that was being used around the beds to protect the veg; in the first year, many non-growers helped themselves, completely denuding the beds of growing veg; loitering night people leave rubbish strewn among the veg and wind funnelling between the blocks blew down my beans last year. Despite all this, I persevere and perhaps next year more people will be encouraged to use the window boxes on their balconies; we may just have started something! For those who have made it through to the end of our story, I hope you've found this interesting! 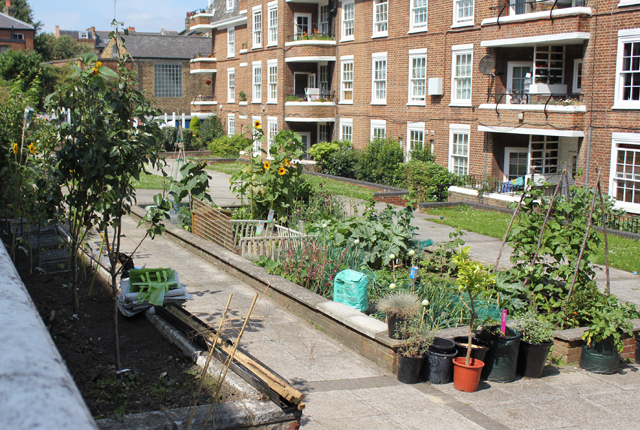 The lessons learned are that gardening is a great way of getting a group of people together, chatting and sharing interests and knowledge; and, secondly, that perseverance will eventually pay off. There have been days when it's been a struggle to keep going, especially with so many calls on my time, but if just one person says what a joy it is to look out onto the results of our hard work, or how delicious the harvest is, then it's worth it. Any questions? I'm happy to help if I can. Great post Caro - a really good read,sounds like Utopia to me. You are lucky to live somewhere with so much history, and photographic evidence. Thanks for reading it all through Elaine and taking time to comment. It is nice to live here as it retains a village-y feel with a sense of shared history. Even people walking through feel this and comment! Imagine what they'd say once the finials are back in place!! Just seen this new bit Caro, I recognise one of those photos! Just a slight correction Caro, that's actually my great grandmother Emily Berry. Thanks, Jo! Sorry for the mistake - did your great grandmother move up here with the family? I'm curious as my grandmother would have been 37 when that photo was taken! Thanks for this further information, Jo. Love the synchronicity of of your great great grandfather being a flowerpot maker - he'd be in high demand today!! I`ve found reading this all very heartwarming and enlightening. I am going to be moving in during the spring, and want to join in with the gardening work. I will have a balcony to grow plants too and hopefully the small strip of ground nearby it. I`m a very keen gardener, and although retired, I love to plant and grow all kinds of things, including vegetables. I look forward to becoming a resident. This is great news, Susanne, and I very much look forward to meeting you! Once the weather is drier, you'll probably find me pottering around, weeding and seed sowing, on weekend mornings and some evenings. It will be lovely to have some help. Not long to go now, a few weeks and I`ll arrive with my plant collection. I do hope I will be able to plant up the nearside part of the adjoining flowerbed to my balcony, I have plans to make it very colourful for all the residents to enjoy. Also I have three metallic windowboxes which I will be attaching to the balcony railings, to have a show of summer flowers and trailing Nasturtiums. I'm looking forward to seeing your plans in action, Suzanne! I'm a big fan of nasturtiums so I hope you'll look out onto plenty of colour in the veg garden and borders as well. What brilliant project, Caro - and how lovely to have all that history too. No doubt you will get more historical feedback as the project gets more widely known, and I am sure the wallaby will help with that! It's become very time consuming as I'm now studying garden design as well as working but there are plans for next year to make the "patch" more herbaceous with perennial flowers and veg inbetween. We hope this will be less labour intensive, even if not so tasty! Thanks for reading and for commenting! Much appreciated! Just wanted to add my congratulations for what you've achieved there Caro. I know how disheartening it can be when people do damage to what you've worked so hard for. My policy is to replant with twice as much and just make it clear that you're not going to be beaten by vandals. Love the old pictures too - what a great sense of continuity that gives, and wonderful to know the names of these lovely people too! I don't look at this history page very often so it's lovely to read it again - I can see that it all looked so neat in the beginning and I'm possibly cramming in too much these days! Expansion is obviously the way to go! Shame that you didn't see the patch in daylight - another time maybe?